Def FX, Australia’s own electronic surf rock band of the 90s, is returning to Australia in 2017 for the national Heaven and Hell tour! Fronted by the enigmatic Fiona Horne and joined by the original line-up, including founding guitarist Blake Gardiner – this is a show not to be missed! “This 20-year reunion tour is a dream come true for the band and our Def Family of fans. It will be the first time in 24 years that Marty and I have performed with Def's founding guitarist, Blake Gardner. And we're super excited to be joined by our special guests, My Life with the Thrill Kill Kult - we're all going to party like its 1996! It's going to be a healing, rocking time!”- Fiona Horne. Def FX will be joined onstage by My Life with the Thrill Kill Kult (often shortened to Thrill Kill Kult or TKK ) on their first ever visit to Australia. Hailing from Chicago’s renowned Wax Trax Records stable of bands, Thrill Kill Kult creators Groovie Mann (lead vocals) and Buzz McCoy (keys/production) have been conjuring up sonic tales of blasphemy, sexcapades and kitschy horror for over 25 years. Their sound is a concoction of experimental, disco, rock, new wave, lounge and glam, interlaced with their signature “sampled dialogue” - a reflection of the duo’s musical influences, and insight into their taste in cinema. During the early 1990s, Thrill Kill Kult had several hits on the U.S. dance club and alternative charts. They also contributed songs to several movie soundtracks and appeared in the 1994 film The Crow. The band has continued to record and tour with a rotating lineup in addition to core members Mann and McCoy. 2017 will mark the band’s 30th anniversary. 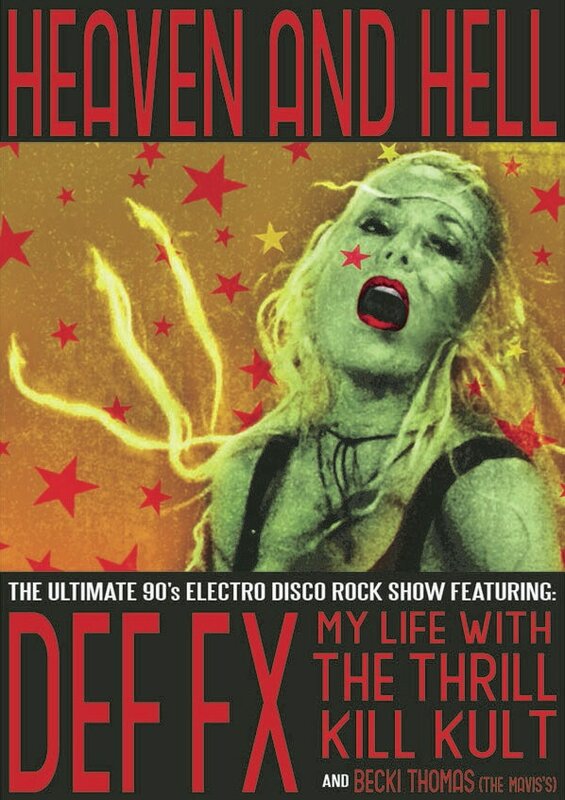 The Heaven and Hell tour will mark a special reunion for Def FX, bringing together the original songwriters and performers that were pivotal in creating that unique 90s Def FX sound and image. They will play all their hits and are releasing a new single especially for the tour. Joined by friends and cult band TKK will make it one of the music events of the year.